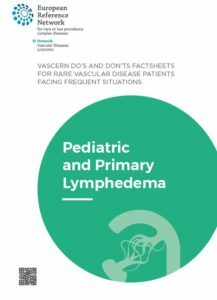 News Do’s and Don’ts Factsheets for Pediatric and Primary Lymphedema available! 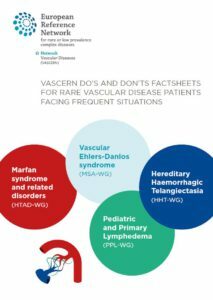 A new chapter has just been added to VASCERN Do’s and Don’ts Factsheets for Rare Vascular Disease Patients Facing Frequent Situations: the Pediatric and Primary Lymphedema Working Group (PPL-WG) have now completed Do’s and Don’ts factsheets for PPL! This means that you can now find factsheets for Marfan Syndrome and Related Disorders, Vascular Ehlers-Danlos Syndrome, Hereditary Haemorrhagic Telangiectasia and Pediatric and Primary Lymphedema. The Vascular Anomalies Working Group (VASCA-WG) are currently working on their proper set of Do’s and Don’ts documents, which should be made available in 2019. The production of these documents by the experts of each of our 5 Rare Disease Working Groups is the deliverable of one of VASCERN’s Work Packages: development of guidelines for optimal care of patients facing frequent situations not related to their rare diseases. We then plan to translate these documents into additional European languages. As a reminder, these factsheets were developped in order to assist patients and the medical community in knowing the basic do’s and don’ts of common and emergency situations (e.g. delivery, anaesthesia, stroke, surgery) that need to be considered in patients with rare vascular diseases. These frequent situations cannot always be handled in the same way in rare disease patients as in the general public and the factsheets outline the special considerations that should be taken into account with each type of event. Professor Miikka Vikkula wins First Generet Award!